Born 21 October 1973 in Chelyabinsk, a city in the Urals bordering Siberia, Lera Auerbach became one of the last artists to defect from the Soviet Union during a concert tour in 1991 while still in her teens. She subsequently earned Bachelor and Master’s degrees from The Juilliard School, where she studied piano with Joseph Kalichstein and composition with Milton Babbit and Robert Beaser. In 2002 she graduated from the prestigious piano soloist program of the Hannover Hochschule für Musik where she studied with Einar-Steen Nøkleberg. Auerbach’s recognition is attributed not only to her musical activities but also to her writing. In 1996, she was named Poet of the Year by the International Pushkin Society. Her literary works include 5 volumes of poetry and prose and numerous contributions to Russian-language literary papers and magazines. Her poetry is taught in Russian schools and universities as required reading for modern literature courses. Following the successfully received recording of Lera Auerbach’s 24 Preludes for Violin and Piano in 2003 with Vadim Gluzman (violin) and Angela Yoffe (piano), BIS released two follow up discs of Lera’s works in 2006: Sonata No. 2 for violin and piano coupled with Lonely Suite – also performed by Vadim Gluzman and Angela Yoffe (BIS CD-1592) – and 24 Preludes for Piano, 10 Dreams and Chorale, Fugue and Postlude performed by Lera herself (BIS CD-1462). A further new CD has also just been released on Capriccio featuring Lera Auerbach’s String Quartet No. 3 performed by the Petersen Quartet. It is coupled with Lera’s arrangement of Shostakovich’s Six Poems of Marina Tsvetaeva. 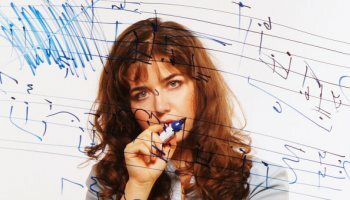 Lera Auerbach’s music has been compared to that of Shostakovich, and with good reason. She remains committed to a fresh use of tonality, without denying herself the full resources of modern technique. The 24 Preludes for cello and piano follow the traditional journey through all the major and minor keys. Next ›Paul Dessau : Agitprop? No; Abstract music? Yes.